In LO Itinerary, real travelers share their real travel itineraries with their Little Ones — what happened, what they recommend, and why. My husband’s brother relocated to Austin a few years ago, and it was time to visit. A huge Thanksgiving meal gave us the perfect excuse, and we decided to extend our stay for a few more days to experience Austin and the surrounding nature. We had read that the Texas Hill Country is the Tuscany of Texas. Yeah… But, anyway, it was fun! Austin seems like an awesome city! Unfortunately, we only had one full day there. But we definitely packed a lot of stuff in. First, we stopped at Torchy’s Tacos, where we ate breakfast burritos, which were chockfull of avocado — perfect for our baby. Unfortunately, we didn’t realize how spicy they might be. And once our baby got a little tired, his burrito-covered hand rubbed his sweet little eye, and ouch! We flushed his eye out with water, and our baby took a nap. Let’s just say, all’s well that ends well. After breakfast, we walked up and down South Congress Street, a very hip area, stepping into fun clothing boutiques and cowboy apparel stores. This beautiful park and river cuts through Austin. Our baby was taking his morning nap, and his best naps take place outdoors with a light breeze.We all really enjoyed this park — for different reasons. My husband’s a politics and history buff, so this was for him. Our baby enjoyed “riding” the goat statues outside. Bonus: one of the bathrooms had a changing table. Thanks, government building! This is located at the UT Austin Campus. We hadn’t eaten since the morning, and I’d been nursing, so I was starving. We got lunch at an on-campus cafe with the most fattening food I’ve ever eaten at once in my life — mac and cheese, corn fritters, french fries. LO was wholly unimpressed. And as for the LBJ Library, I enjoyed the movies, and LO enjoyed holding our hands and practicing his toddling. My in laws were wonderful enough to babysit LO, so that my husband and I could see our first movie in 10 months! Alamo Drafthouse is a movie theater and restaurant in one. So, we got to stuff our faces with beer, pizza, and chocolate cookies a la mode while watching Brad Pitt and Marion Cotillard be gorgeous. Yes, we saw Allied. And yes, you’ll feel hungover in the morning if you eat like that post-age 30. We used Fasten because Uber and Lyft were banned from the city. It got the job done, but the GPS was often off so we had to let our drivers know exactly where we were — which is not always easy when you don’t know where that is. We brought our own car seat, a Graco which snaps into our Baby Jogger City Mini. The most spectacular Airbnb I’ve ever stayed in, thanks to my in-laws. Anyway, we borrowed a Pack N’ Play from my brother-in-law’s family, so I’m not sure this is relevant. In the 1830s, lots of German immigrants settled in the Texas Hill Country, and the town is still extremely German. There are tons of German restaurants and signs in German. We chose to stay there because it was quaint, located not too far from cool hikes, and had amenities like restaurants, a big supermarket, and decently priced hotels, which are all pluses when traveling with a baby. We arrived here at night. This restaurant was uber German with German murals, lots of beer on tap, and waitresses wearing traditional fraulein dresses. Also, there were deer heads mounted on the wall. The food was delicious, and they had a high chair for us. We rented a car from the Austin airport. It was a very good decision. Peach Tree Inn. A spacious room with a Pack N’ Play was waiting for us when we arrived, along with complimentary bottled water and wine. Very well priced at $79/night. Breakfast is included in the small reception area. Don’t expect a high chair or the staff to be too friendly. But with everything else included, we didn’t mind. This park is stunning and really does look enchanted. There are several paths, which aren’t too difficult. The path is rocky, though, so you’ll want to wear shoes with a good grip. We wore our little one in an Ergo Baby 360 carrier and switched him around a few times — facing front, facing us, and on our backs, depending on whether he wanted to nap or not, as well as the strength of the sun. 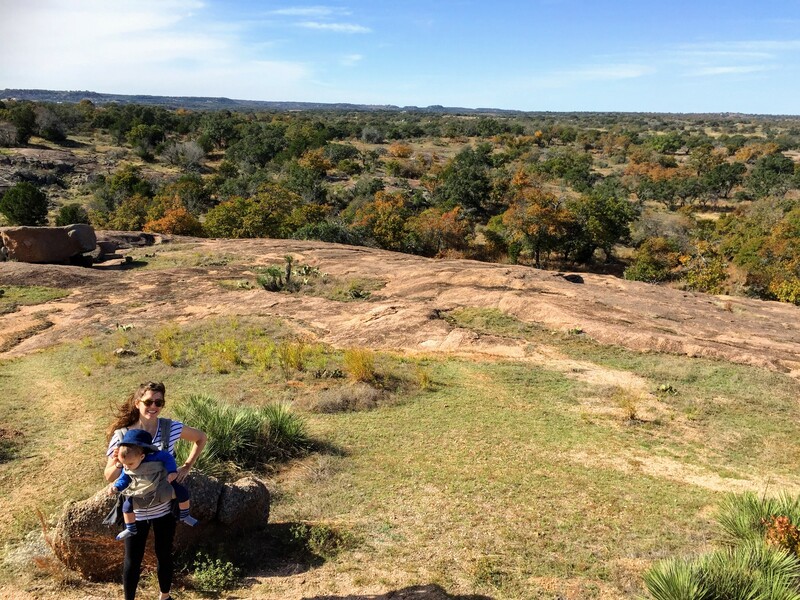 Enchanted Rock was a 25-minute drive from Fredericksburg. We wandered around the town and were having a good time, until we entered a store that sold guns from different eras, as well as Confederate flags. Ugh. We took our little one to the Christmas sculpture garden in the “Marketplatz” so that he could get some energy out. But, we decided not to spend any more time in Fredericksburg after that. Definitely not as beautiful as Enchanted Rock, but the hikes were flat and lovely. At the end of the hike, there’s a river with a pretty overlook. This hike has very little shade, so come prepared. At first glance, this city mesmerized me. We started strolling along the stunning Riverwalk, which feels Venetian and fairytale-like at once. Our mistake was expecting the area surrounding the Riverwalk to be just as charming. Instead, it was desolate and seedy. We quickly made our way back to the Riverwalk, and ate taco salads alongside color lights over the shimmering water. Rachel Sales is a writer, entrepreneur, world traveler, wife, and mom. She’s the founder of Little One Travel.